Update: After intense pressure from outside groups, the Meadows Club, the venue of the Hizb ut-Tahrir Khilafah conference, has announced that it will not provide accommodations for the event. HT organizers have announced that a new venue is being sought and its location will be announced as soon as possible. 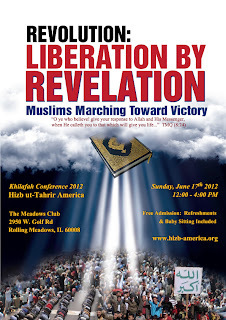 An international Islamist organization bent on establishing a worldwide Islamic theocracy plans to hold its third Khilafah (Caliphate) conference later this month in a Chicago-suburb. Hizb ut-Tahrir America (HT), the U.S.-arm of the international organization with a long record of hostility toward Israel and the Jews, plans to hold the conference, dubbed “Revolution: Liberation by Revelation – Muslims Marching Toward Victory,” in Rolling Meadows, Illinois. This year’s conference will once again be held against the backdrop of the revolutions engulfing the Middle East, which the organization seeks to use to promote its vision of establishing an Islamic Caliphate. HT’s second Khilafah conference, which was held in June of last year, focused, in part, on the organization's view that capitalist and nationalist systems of the West are "enemies to Islam.” It drew significantly fewer people than its first conference in 2009, which attracted approximately 400 people. HT has attempted to capitalize on the Arab revolutions in the Middle East and North Africa by tapping into peoples’ frustrations over events taking place in the restive region. Several months ago, for example, the group organized a rally in downtown Chicago to protest the Assad regime’s crackdown in Syria. Troubling BDS News on Campus?